The death rate in New York was 15.1 per 100,000 persons in 2016. In the same year, the national rate was 13.3. The number of deaths related to prescription opioids while high, remained stable from 2006 through 2009. Since 2009, deaths related to prescription opioids nearly doubled to 1,100 deaths. 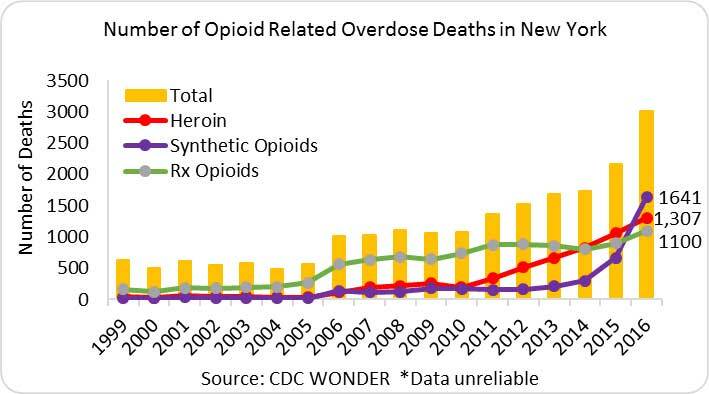 Heroin-related deaths more than doubled between 2012 and 2016, while deaths related to synthetic opioids (dominated by fentanyl) increased ten-fold in the same period. Opioid-related emergency department visits increased 73 percent from 2010 to 2014. Naloxone was administered during 11,992 emergency medical services calls in 2014—57 percent more than in the previous year (7,649 in 2013) (NYS Annual Opioid Report, 2015). 118,875 (42 percent) of the 281,800 admissions to NYS certified substance abuse treatment programs in 2014 included “any opioid” as the primary, secondary or tertiary drug problem—up 19 percent from 2010 (100,004) (NYS Annual Opioid Report, 2015). 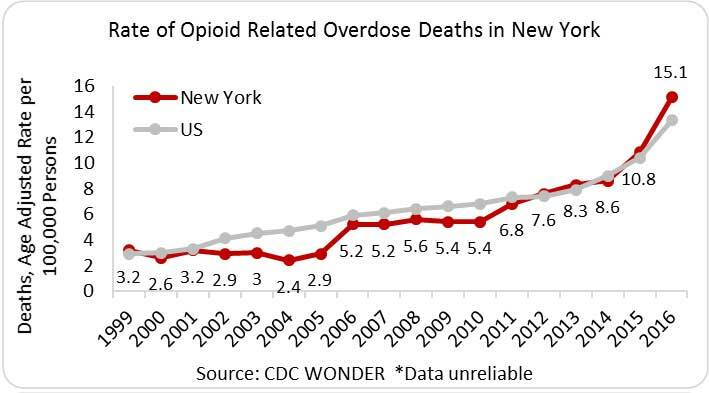 In 2015, New York State prescribers wrote 10.2 million opioid prescriptions or 51.3 prescriptions per 100 persons–a 7.8 percent decline since 2013 and less than the national rate of 71 prescriptions per 100 persons (IMS Health). The incidence of NAS in New York doubled from 1.8 cases per 1,000 births in 2009 to 3.6 cases per 1,000 births in 2013 (CDC, MMWR, 2014). The average across the 28 states included in the 2013 analysis was 6.0 cases per 1,000 births. State Incidence: Of the new HIV cases in 2015, 3,123 occurred in New York, with 8.6 percent1 of new cases in males and 15.3 percent of new cases in females attributed to IDU (AIDSVu). State Prevalence: In 2014, an estimated 130,753 persons were living with a diagnosed HIV infection in New York—a rate of 782 infections per 100,000 persons. Of these, 27.5 percent1 of males and 30.4 percent of females were living with HIV attributed to IDU (AIDSVu). State Incidence: In 2015, New York reported 14,099 cases of chronic HCV and 122 cases of acute HCV (NY.gov) at rates of 71.4 cases per 100,000 persons and 0.6 cases per 100,000 persons, respectively (NY.gov). From 2013 to 2014, New York reported 29,593 cases of chronic HCV and 258 cases of acute HCV. Of these, an estimated 54.3 percent of chronic cases and 77.3 percent of acute cases were attributed to IDU (NY.gov). State Prevalence: As of 2015, an estimated 200,000 persons were living with HCV in New York (NY.gov). New York is home to one of the eleven Centers of Excellence in Pain Education (CoEPEs): The Rochester Area Collaborative Center of Excellence in Pain Education. 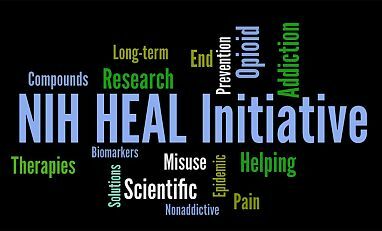 The CoEPEs act as hubs for the development, evaluation, and distribution of pain management curriculum resources for medical, dental, nursing, pharmacy and other schools to improve how health care professionals are taught about pain and its treatment.